Dry Drinker Ltd is proud to announce that it will be running, what we believe is, the first ever beer judging in the UK solely for drinks with an ABV of 0.5% or lower. This innovatory event is taking place on 29th November 2018. We now stock over 100 different beers and lagers and we are often asked for recommendations. To help, we have selected our best-selling customer favourites and some of our new to market discoveries for judging by an independent panel of brewers and industry experts. 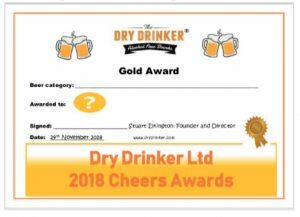 The Dry Drinker Cheers Awards have 50 drinks in 7 judging categories. We are really looking forward to this exciting, prestigious event and will keep you posted on the winners. Keep your eyes out for our Twitter, Instagram and Facebook pages for more news! Next post: Why Have “The Dry Drinker Cheers Awards”?